Note : Flute Tonic : C. Key : G. 7 Finger Holes is used in the Tutorials of Instructional Book - CD. 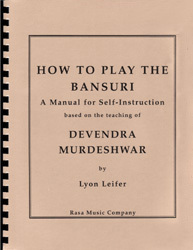 A Manual for SELF-INSTRUCTION Based on The Teachings of Devendra Murdeshwar. By Lyon Leifer. "You have given good information about the bansuri and in my opinion this book should be a boon to a student who takes up flute sincerely and seriously." A new book designed to offer a comprehensive beginning course in the technique of the North Indian, keyless bamboo flute. Profusely illustrated with charts, exercises, photographs of playing positions, and decorative material, the manual will enable the student to learn authentic raga materials and methods of development, as taught by the master flutist and flutemaker, Shri Devendra Murdeshwar. The manual explains fundamentals of a number of essential topics in Indian Classical Music. The scalar system, the concept of raga, microtonalism, the system of teaching and learning, and the instrument's history are all covered. Students of the bansuri will, of course, find this book particularly useful. In addition, this manual will prove helpful to all flutists seeking to broaden their viewpoint and range of expression. Other students of Indian music may also find its viewpoint and method for teaching the music's performance highly useful. Jazz Musicians will find in it an especially useful compendium of scales and scale patterns which can be put to use in various contexts. The C D presents examples of all the major exercises and performed versions of all the compositions included here, as well as providing drone tambura and tabla accompaniment for the student's own practice. An Introduction to Lyon Leifer. North Park University, Chicago, Illinois, USA. Lyon Leifer began studying Indian Music and Bansuri in 1965, after obtaining a degree in flute from the Juilliard School and holding the second flute chair in the St. Louis Symphony. In addition to Devendra Murdeshwar, his flute teachers have included Julius Baker, Walfrid Kujala and Emil Eck. Mr. Leifer resides in the Chicago area where he is an active performer and teacher of both Western and Indian classical music. Appearances have taken him to venues ranging from New York's Lincoln Center to the hall of the Shanghai Symphony, with appearances in any number of places in - between. His performances of raga music on the bansuri have been particularly welcomed by Indian audiences and by music critics of the Indian press. To view Lyon Leifer's Home Page.